Dipoles fed with an open wire line are called “Double-Zepp” or “Doublet”. 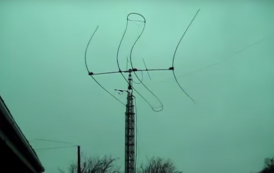 The dipole (2 x Xm) may have any length, the open wire feeder (2 x Ym ), too. You can choose the lengths as your local facilities allow. 1. The impedance is very low. That is hard to match and the losses are high. 2. We have impedances from 15-100 +/- j X Ohm. In that case a Balun 1:1 is the right choice for open feeders. 3. We have medium impedances (200-600 +/- j X Ohm). That can be matched without any problems with the most tuners. If you have an asymmetric ATU use a balun 1:4 to match the open wire feeder. 4. The impedance is very high (> 1 KOhm). Most tuners have difficulties and the voltage in the matching system is extreme high. 1 and 4 should be avoided. But how can we calculate the impedances at Z Z? The first method is “trial and error”. Connect the tuner and try to match the system. In many cases that will be successful, but it may be that some bands cannot be tuned. Then make the feeder shorter or longer and try it again.